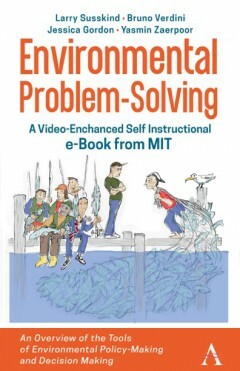 Environmental Problem-Solving - A Video-Enhanced Self-Instructional e-Book from MIT’ offers an online, self-paced curriculum for college and university students who want to learn the basic techniques government agencies, citizen action groups, corporations and research institutions use to solve pressing environmental problems. The e-book includes links to short videos showing the best MIT student responses to weekly assignments and exam questions. The book is divided into four sections: The first section focuses on how certain environmental problems can only be solved through active government effort to implement policies that effectively take science and politics into account. This section introduces readers to foundational concepts, including the steps in the US federal environmental policy-making process, and offers an action-oriented analysis of how environmental policy gets implemented and how practitioners can use comparative analysis of public policy in environmental problem-solving. It concludes with questions about the possibility of a unified theory of environmental policy making. The section empowers readers to develop, through exercises and videos, a solid framework to shape an action plan to solve specific environmental problems. The next section focuses on formulating a sound philosophical basis for taking action in environmental problem solving situations. This includes a discussion of several ethical frameworks that practitioners can use to underpin the actions they propose. This section begins with a general overview of environmental ethics, and then moves on to a discussion of utilitarianism versus intrinsic value, deep green approaches to environmental problem-solving, the debate over sustainability versus economic growth, and how science and indigenous knowledge can be applied in a wide range of environmental problem-solving situations. The section, through exercises and videos, empowers readers to take a stand on these debates, drawing on practical cases with worked examples. The penultimate section helps environmental practitioners understand how to use various analytical tools. It includes a quick survey of traditional and non-traditional evaluation tools, discussing the strengths and weaknesses of each tool, focusing on environmental impact assessment, cost benefit analysis, ecosystem services analysis, risk assessment, simulation and modeling, and scenario planning. The section, through interactive exercises and videos, empowers readers to practice multi-party environmental problem-solving, and to identify the power of each tool to enhance environmental problem-solving, developing the judgment to enumerate strengths and weaknesses as they see them playing out in practice. The concluding section is a survey of the theory and practice behind mobilizing support for particular problem-solving ideas. It includes discussions of democratic decision-making and environmental problem solving, how the public can be brought in as a partner, methods of collaborative decision-making, the ideas of consensus building, and how politics and power sway collective action efforts. Dr. Lawrence Susskind is Ford Professor of Urban and Environmental Planning and Head of the Environmental Policy and Planning Group at MIT. One of the founders of the field of environmental dispute resolution, he has been teaching at MIT and Harvard for 45 years. Dr. Bruno Verdini is Director of the MIT-Harvard Mexico Negotiation Program and Lecturer in Urban Planning and Negotiation at MIT. He teaches MIT’s popular course the ‘Art and Science of Negotiation’. Jessica Gordon is completing a PhD in Environmental Policy and Planning at Massachusetts Institute of Technology (MIT). Gordon has worked on environmental issues including climate change, natural resource management and food security. Yasmin Zaerpoor is a doctoral candidate in Environmental Policy and Planning within the Department of Urban Studies and Planning at the Massachusetts Institute of Technology (MIT).